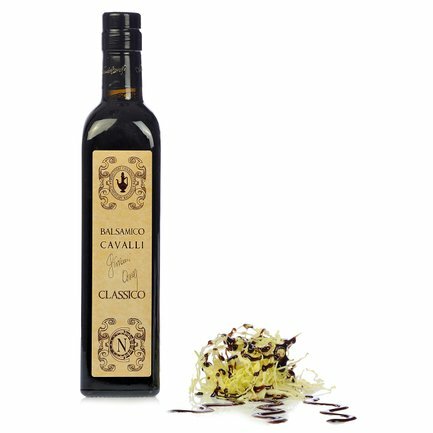 What is the secret of the Cavalli Balsamic Vinegar Condiment? Simple: the exclusive use of cooked grape must, fermented, turned to vinegar and left to age in oak, mulberry, juniper, chestnut and cherry wood casks. Use this antique Emilia tradition every day to enrich every dish with the unmistakeable balsamic vinegar touch. Ingredients Product obtained from 100% Italian cooked must (must=grape juice) of white grape Trebbiano acetified and aged in barrels of different woods. No thickeners, coloring or flavoring are ever added. For more information on product labels, please contact our Customer Service department. The information on the labels of the products may vary for reasons beyond our control, therefore, there may be discrepancies between the information on the site and that on the products delivered. Please always check the information on the product before consumption or use. With considerable experience as wine maker since 1920, Ferdinando Cavalli decided to amaze friends and clients with an initial production of vinegar using his quality grape musts that are the heart and soul of his wines. Original Emilia ingredients and lots of passion are fundamental to the essence of Cavalli vinegar, today known throughout the world. The company continues in its meticulous research to better understand this condiment that represents Italian tradition around the globe.